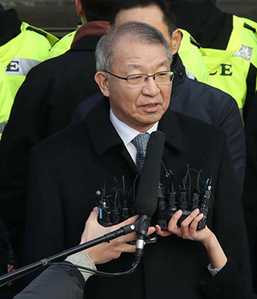 Former Supreme Court Chief Justice Yang Sung-tae was indicted Monday for abuse of power and corruption in office. Prosecutors launched their investigation of Yang in June last year and concluded that he has a raft of cases to answer, mainly in regard to doing favors for the government of disgraced ex-President Park Geun-hye in return for support in establishing a higher appellate court. Most of the 47 charges are related to accusations that he rigged cases in favor of the Park administration and sidelined judges considered unfriendly to her. One accusation is that he deliberately held up a trial over compensation of Korean victims of forced labor in imperial Japan to spare Park a diplomatic embarrassment. 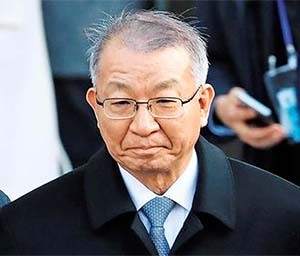 He allegedly told Kim Yong-duk, the then chief justice in the case, in June of 2014 that he believed a 1965 bilateral treaty nullifies all personal claims for compensation from Tokyo. Prosecutors believe Yang was also involved in making a blacklist of judges who were opposed to his policies.